Our banquet and meeting facility can accommodate your group up to 50 guests with a four-hour time limit for your approved event. A flat fee….we will have the tables and chairs ready for your event and you are responsible for everything else, including clean up. Upgrade with dish and table options…for only $3.00 per guest, you will have your choice of fine china or vintage crystal, complete with lace tablecloths, deluxe paper napkins, placemats, dishware, flatware, glassware and table centerpieces. 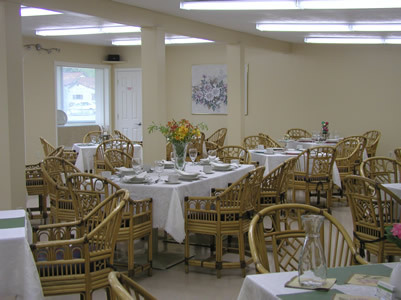 We set up your banquet, clean up the banquet tables and wash the dishes. In addition to the $3.00 per guest, the flat fee applies. You will bring your pre-prepared food/beverages and will be responsible for the food/beverage clean up. Choose from our approved catering options and you will be able to show up for your event with everything expertly handled. You will pay the menu price, which includes the upgraded dish and table options. In addition to the per person price specified in each menu selection, the flat fee applies. Please request an Event Planner for this option. Sales tax of 6% and gratuity are additional charges.